This past weekend, we had the amazing opportunity to pre-screen this breathtaking film before it hit theatres today, December 20th. This movie transports its viewers back to the Late Cretaceous prehistoric period where all types of dinosaurs walked the land. The movie adventure is in 3D, which provides an even more realistic experience for the audience. We went as a family and with two little girls in tow. 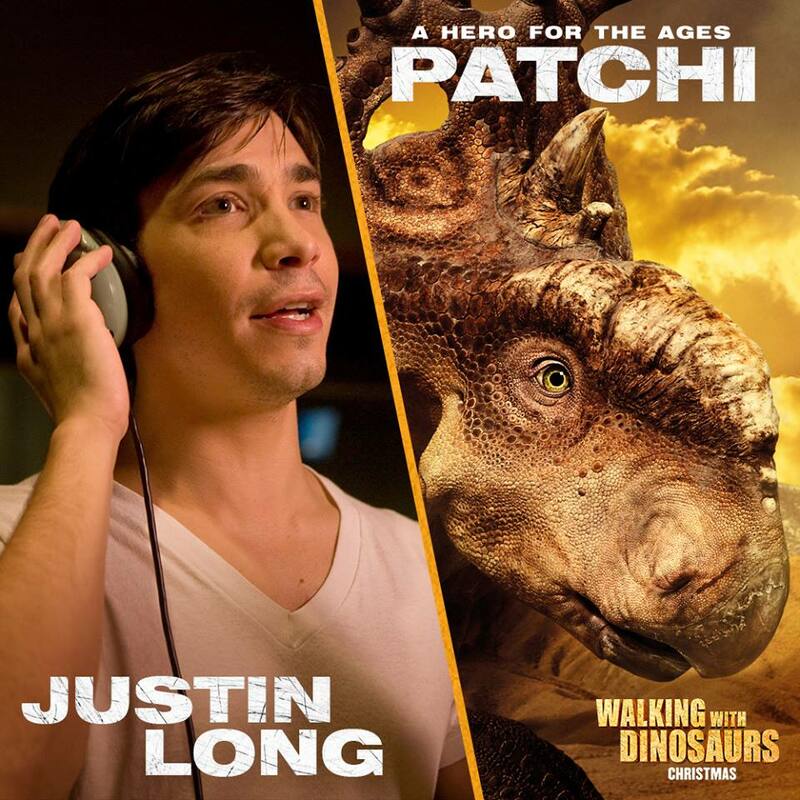 You may recognize a few names in this movie, for one, Justin Long plays ‘Patchi’, a Pachyrhinosaurus, who is the hero of the movie. He may not be the biggest dino on the block but, what he doesn’t have in size he makes up for in heart and determination to survive through very ‘real’ situations which eventually leads him to be the leader of his herd. He has humor, a lot of spirit and you’ll quickly fall in love with him. Another character that you’ll love (and recognize) is Alex, who is played by John Leguizamo. He is hilarious, witty and sometimes a bit sarcastic. He is an Alexornis bird and your guide through Patchi’s journey. These birds have a symbiotic relationship with the Pachyrhinosaurus. They help by picking the ticks and other insects off of the dinosaurs and in turn, get a nice place to perch. You’ll find Alex to be not only an educator but, he turns out to be Patchi’s conscience throughout the movie. The movie has many interesting characters like Patchi’s best friend and companion, Juniper and Patchi’s brother, Scowler. From the very simple Edmontonia, the sneaky bird-like Hesperonychus to the very impatient Pterosaurs. You’ll also learn all the different types of dinosaurs in this prehistoric period. I love how they made the film entertaining all while captivating a documentary style, freeze frame sequences to highlight educational tidbits about the dinosaurs. Gabby and Mimi absolutely LOVED these parts of the movie and what they learned stuck with him since they told me verbatim what they learned. The story follows two brothers, Patchi and Scowler and their friend Juniper as they follow the migration of their herd. But, before they do that, they are faced with hard situations that they must first overcome. You see the growth, the adventure and the hardships they endure to eventually walk and lead the migration on their own. Of course, you can’t have a story without a villain and in this story there are a couple of predators that are identified but, the one that really becomes a head to head contender with Patchi is Gorgon. He is a smart, fast and terrifying Gorgosaurus, he’s always on the lookout for the next kill. He is like a super-charged T. rex, and will stop at nothing to feed his extended family. The girls loved the freeze frame educational on Gorgon. We all laughed! Dinosaurs Walk the Land Again. The live action footage in this film is absolutely gorgeous. The landscapes, sounds and exteriors are definitely enhanced by the 3D CGI action. 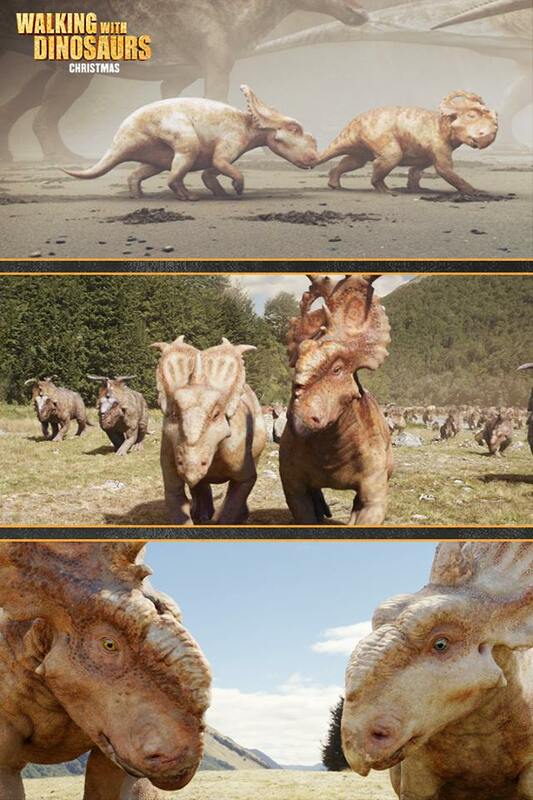 The fire in the opening scene is remarkable and the scenes throughout the movie really make you feel like you are truly Walking With Dinosaurs. The story itself is very simple, it has simple characters with a lot of heart and it truly shows the complex yet very primitive way that dinosaurs would have lived and fought to survive and thrive in the prehistoric world. Head out and watch this movie with the kids, I think waiting to watch it at home won’t do it justice as the 3D really makes the experience. Gabby and Mimi both enjoyed it. Mimi covered her eyes a bit when Gorgon hit the screen but, otherwise–little ones will enjoy it just as much. Even us adults enjoyed it and had a lot of belly laughs. My brother, who doesn’t have kids yet, said that he enjoyed the film as well. He found it to be very educational and definitely a good movie for the kids. I think that if you appreciate good imagery, you’ll love this movie! Visit the Activity Page on the film’s official website to download free coloring pages here, here & here PLUS play online games including Match Three, Memory and Slider Puzzle! 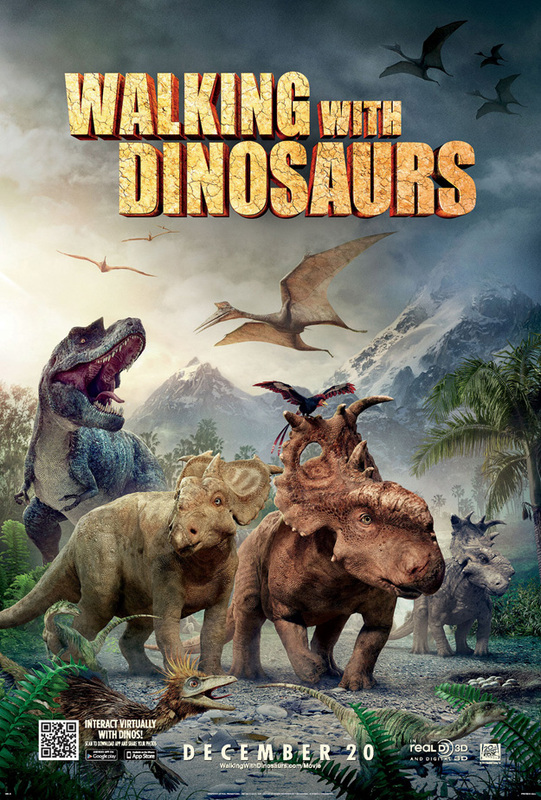 Will you be watching Walking with Dinosaurs in 3D this weekend? Visually stunning is right! I love John Leguizamo… he is super talented and I can't wait to see this with my daughter. It was awesome. Your daughter will love it. Yes, John Leguizamo is hilarious. He brought the humor. sounds fantastic! Love the idea of watching a great movie that is also educational. I think my boys would love it. This looks awesome!!! Looks like a great movie! This looks so entertaining for the whole family! I can't wait to take my gang! I won't be watching it this weekend but would like to see it at some point.It sounds very interesting and I think my youngest might get a kick out of it. We are SUPER excited to see this as a family!!! I have seen a few previews on tv for it, and it looks amazing! Everything John Leguizamo touches is golden, and Justin Long is breaking out. I totally want to see this! wow, that looks amazing! I think it wouldn't be something I would consider based on the picture, but that trailer looked amazing!!! I know my boys would love this!